I often joke that I am the way I am because I grew up up the street from a Chemical plant. I’m not making it up though. Allied Chemical had a plant at the end of my street. 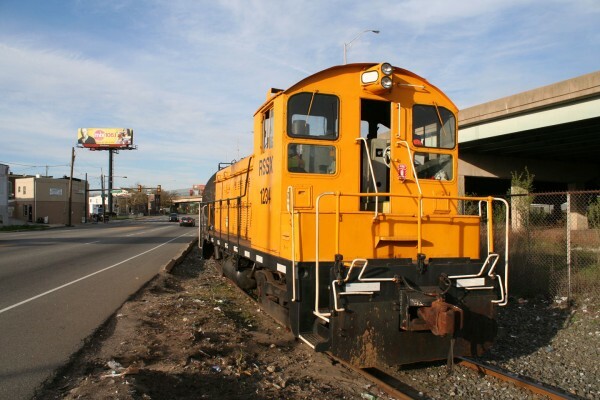 Conrail served this plant via a spur with lots of character, and I’ve long wanted to catch a train there again. 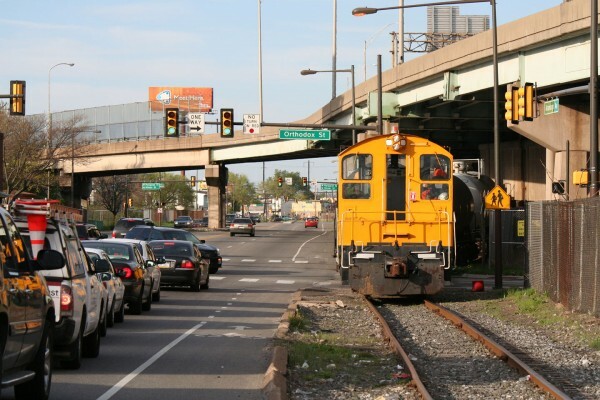 I finally had a chance to do that on my recent railfan trip to Philadelphia. 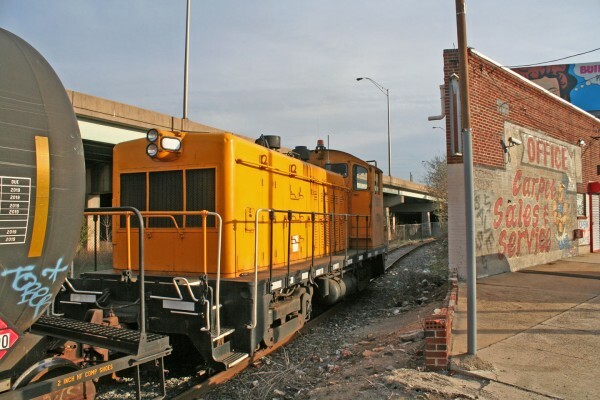 While the rest of the trip was pretty standard, but fun, fare, we got lucky and caught the switcher that currently serves the former Allied Chemical, now Honeywell plant in the old neighborhood. Honeywell actually has a decent website about the plant, which you can visit to get some background on it. 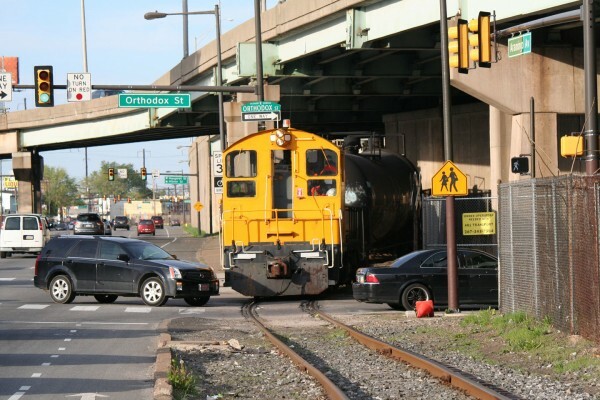 While I was growing up, it was served by Conrail (usually by end cab switchers, which explains my love of them), but now it’s contracted out to Railserve, Inc.
Conrail Shared Assets drops cars off in the former Aramingo Ave TrucTrain yard, and the Railserve crew comes out to sort them out and pick them up. Catching this happening, though, is rare, so when we spotted the yellow NW2 (amusingly numbered 1234) in the yard, we decided to wait around for him to go somewhere we could get some photos. Our patience was rewarded, with the switcher shoving a cut of tank cars from the sunny end. 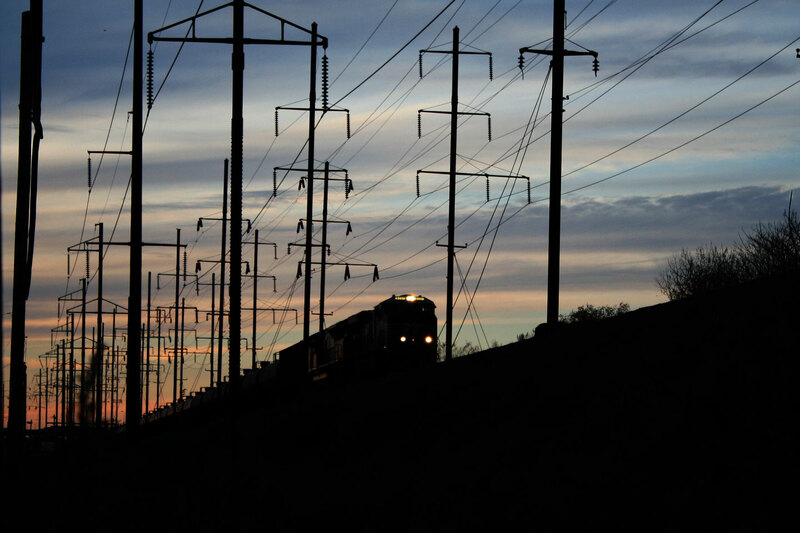 These are some of my favorite railfan photos, because I finally got to “close the loop” and shoot an operation I remember from growing up, but not having any photos or real documentation of. Here’s what I got from that afternoon. 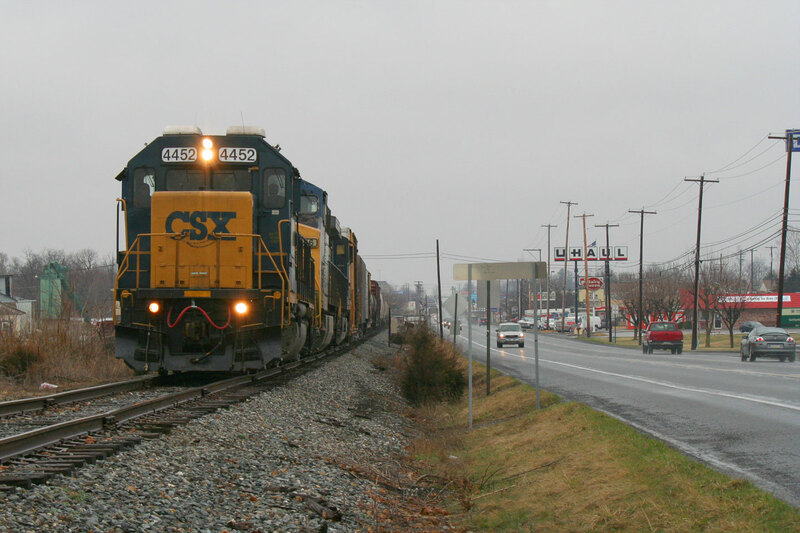 My friend Ben captures the first view of the train, emerging from behind the local businesses. 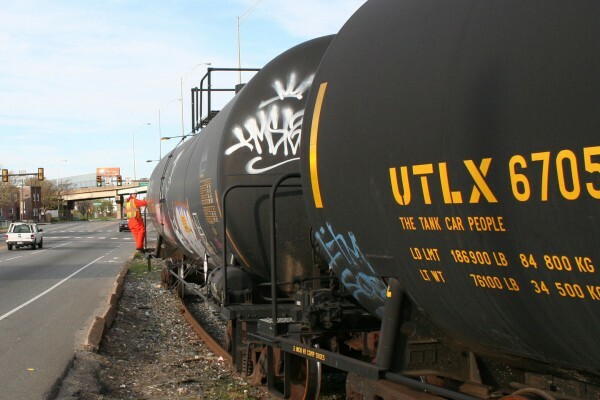 The conductor guides the shove move from the end of the first tank car. I remember the crews doing this when I was young, and also tossing fusees to “protect the crossing” as they went across it. Railserve 1234 comes into view behind the oddly shaped carpet company on Aramingo Avenue. Face to face with an NW2. The power just about to clear Orthodox St.
For me, part of the charm of this branch is the way that the tracks snake along, and under I95. Here, the train ducks under the highway, while traffic pays it no mind. 1234 peeking out from under the highway. 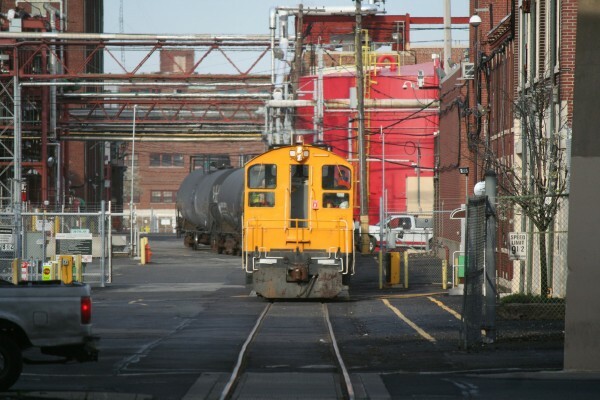 Finally, the train makes its way back into the plant. It’s actually running down the center of the (long closed off) Bermuda St. 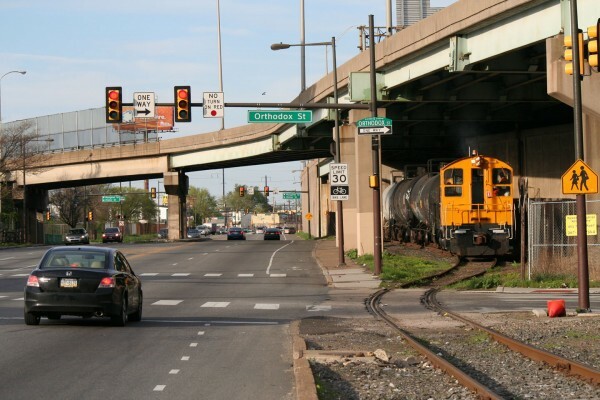 I was able to look up the street and see the headlight of Conrail switchers at this same spot when I was a kid.